A deeper understanding of the swallowing mechanism is critical for accurate assessment and targeted treatment. 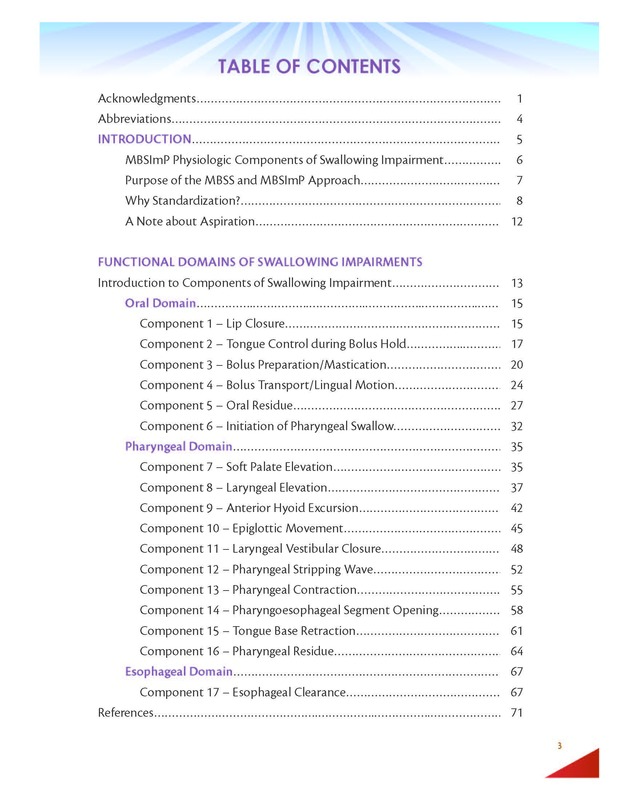 Provides a standardized overview in the anatomy and physiology of swallowing, and is appropriate for all clinicians working with dysphagic patients across the continuum of care. Focuses on the physiologic factors requisite for the execution of normal swallowing to facilitate a deeper understanding of the swallowing mechanism, which is critical for accurate assessment and targeted treatment. 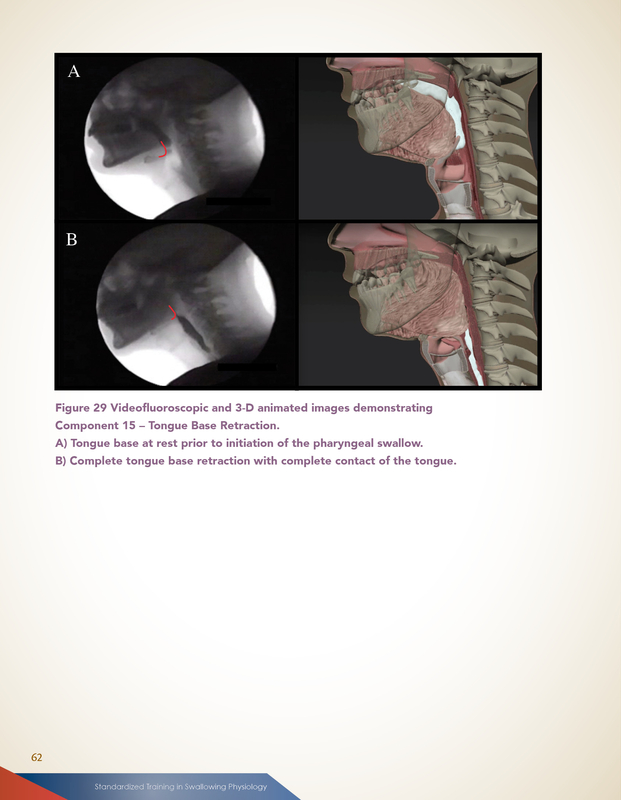 Each component is individually presented and includes customized medical-anatomical illustrations, fluoroscopy visuals, and computer-generated swallow imagery. 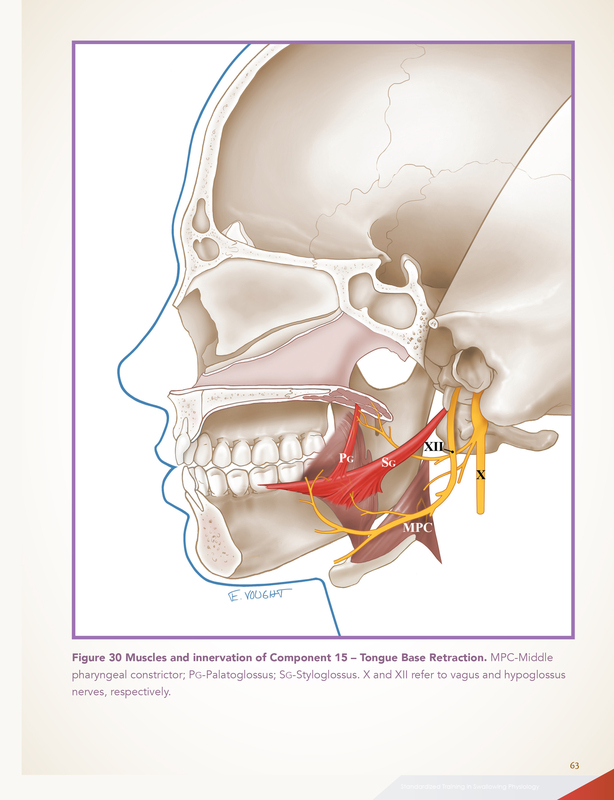 Utilize the handy tables and detailed illustrations as a quick reference for the anatomy and neural innervation of specific swallowing structures to better target treatment. 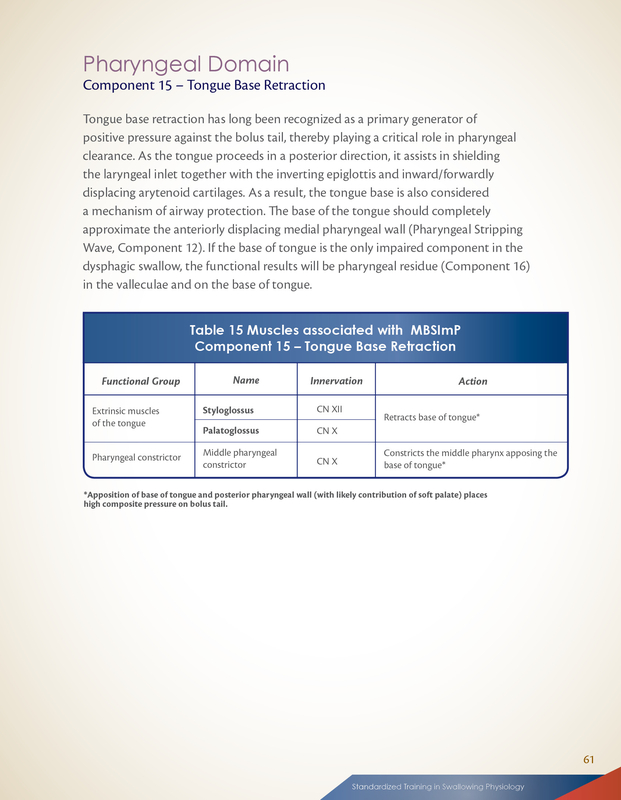 Further, this manual advocates for a standardized approach toward the MBS study. Learn how standardized results identify and report specific physiologic impairment, and lead to evidence-based, targeted interventions. The focus is the adult population. Softcover, 76 pages, ©2015. Overviews physiologic factors requisite for normal swallowing. Details evidence-based physiologic components of the adult swallowing mechanism. Features handy tables listing the muscles and nerves responsible for the function of each component. Advocates for a standardized approach to the MBS study. Discusses importance of using MBS study results to identify specific physiologic impairment, rather than focusing observations solely on the presence or absence of aspiration. Appropriate for all clinicians working with dysphagic patients across the care continuum. Also a great resource to supplement graduate level dysphagia course curriculum. PhD, CCC-SLP, BCS-S, ASHA Fellow, is the Alice Gabrielle Twight Professor in the Roxelyn and Richard Pepper Department of Communication Sciences and Disorders, and Associate Dean for Academic Affairs in the School of Communication at Northwestern University. She is also Professor, Otolaryngology-Head and Neck Surgery and Radiation Oncology, Feinberg School of Medicine. She is a Past-President of the Dysphagia Research Society, past Chair of the Specialty Board for Board Certification in Swallowing and Swallowing Disorders (BCS-S), and Associate Editor for the Dysphagia Journal. She is an ASHA Fellow, recipient of the 2016 Admiral Albert J. Baciocco Innovation Award – Medical University of South Carolina (MUSC), The 2017 12th Annual Pepper Lecturer, Northwestern School of Communication, Honorary Member of the MUSC Chapter of The National Academy of Inventors, recipient of Honors from the South Carolina Speech-Language-Hearing Association (SCSHA), 2010 MUSC College of Health Professions Scholar of the Year Award, and associate member of the Academy of Otolaryngology-Head and Neck Surgery and the American Head and Neck Society. Dr. Martin-Harris is the author and developer of the first standardized method for videofluoroscopic assessment of swallowing impairment (Modified Barium Swallowing Impairment Profile, MBSImP™), translated to research and clinical practice in the United States, Canada and 13 additional countries. She is also author of the manual, "Standardized Training In Swallowing Physiology—Evidence-Based Assessment Using The MBSImP Approach" published by Northern Speech Services. Her work is funded by the National Institutes on Deafness and Other Communication Disorders (NIDCD), the Veteran's Administration, and the Mark and Evelyn Trammell Foundation. Financial — Bonnie Martin-Harris is presenter of CE seminars and online CE courses sponsored by Northern Speech Services; receives speaking fees and royalties. Financial — Bonnie Martin-Harris is author of "Standardized Training In Swallowing Physiology — Evidence-Based Assessment Using The MBSImP Approach" published by Northern Speech Services; receives royalties. Financial — Bonnie Martin-Harris' former employer, MUSC, receives royalty payments from Northern Speech related to enrollment tuition of the MBSImP Online Training. Financial — Bonnie Martin-Harris' MBSImP research and development was funded in part by Bracco Diagnostics; received grant funding. Financial — Bonnie Martin-Harris' research is funded in part by the Veteran's Administration (VA); receives grant and research funding. Financial — Bonnie Martin-Harris' research is funded in part by the Mark and Evelyn Trammell Foundation; receives grant funding. Financial — Bonnie Martin-Harris' research is funded in part by the National Institutes on Deafness and Other Communication Disorders (NIH/NIDCD); receives grant and research funding. Nonfinancial — Bonnie Martin-Harris is associated with numerous journals, publications and boards related to speech-language pathology; receives no compensation in these roles. Using this product? Please email us with your comments/review.